I just noticed this happen to a VM I was connected to this evening. All I did was change the primary DNS from automatically assigned to manual, gave it a DNS server IP, and provided a backup secondary IP, and my RDP session was instantly dropped. Other HTTPS traffic to the box stopped too. I had to restart the VM in Azure to get connectivity back. This VM was deployed using the classic portal, but I’ve seen reports of it happening on newer ARM deployed VMs too. Here’s a thread with others that have found the same issue. Hopefully Microsoft will resolve this soon. The second half of my presentation I dived into a live PowerCLI and PowerShell demo where I demonstrated some PowerCLI basics to get any kind of information out of your vSphere environment using some of the core cmdlets. I demonstrated use of the core PowerCLI cmdlets used for retrieving VM, Host and Datastore information, how to use the pipeline in PowerShell, and taking a look at all properties on any PS object using the Get-Member cmdlet on the pipeline. After covering these basics, I took a blank vCheck plugin template, and showed how easy it is to create your own custom plugins for vCheck should you find that the existing plugins don’t cover everything you need. I’ve got a link to download the slides for the presentation below, and hopefully I’ll be able to find a recording of the PowerCLI / PowerShell live demo I did to attach to this post as a follow up. 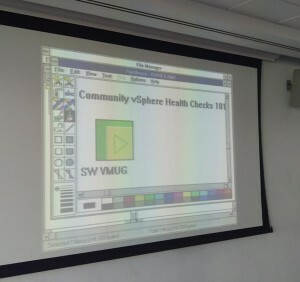 If you’re based in the South West of the UK, be sure to check out and attend the next SW VMUG meeting! I’ve been working on a very cool project that involves the use of Microsoft Azure, TeamCity and Octopus Deploy. I have created an Azure PowerShell script that deploys VMs into an Azure Subscription (Web machines that run IIS) as a part of a single Azure Cloud Service with load balancing enabled. As such, the endpoint ports that I create for Octopus tentacle communication need to differ for each machine on the public interface. I wanted to fully automate things from end-to-end, so I wrote a very small console application that uses the Octopus Client library NuGet package in order to be able to communicate with your Octopus Deploy server via the HTTP API. The OctopusConfigurator console application should be run in your Azure VM once it is deployed, with 4 x parameters to specify when run. It will then establish communication with your Octopus Deploy server, and register a new Tentacle endpoint using the details you pass it. The standard port number that gets assigned (10933) will then be replaced if necessary with the correct endpoint port number for that particular VM instance in your cloud service. For example, I usually start the first VM in my cloud service off on 10933, then increment the port number by 1 for every extra VM in the cloud service. As the deployments happen, the console application registers each new machine’s tentacle using the incremented port number back with the Octopus master server. Once the Azure VM deployment is complete, I tell the VMs in the cloud service to restart with a bit of Azure PowerShell and once this is done, your Octopus environment page should show all newly deployed tentacles as online for your environment. Here is an example of an Invoke-Command scriptblock that I execute remotely on my Azure VMs as soon as they have completed initial deployment. What I do is tell the VM deployment script to wait for Windows boot, so once ready, the WinRM details are fetched for the VM using the Get-AzureWinRMUri cmdlet for Azure, which allows me to use the Invoke-Command to run the below script inside the guest VM. Write-Host "Full path is: $fullPath"
[string]$ConfiguratorPath = DownloadFileUrl "//dl.dropboxusercontent.com/u/xxxxxxx/Apps/OctopusConfigurator.zip" "C:\Temp" "OctopusConfigurator.zip"
I’ve not had a lot of luck in the past with updating my VMware Fusion installs. Since version 5.x and upwards through to 6.x I’ve always had some annoying bugs or issues crop up when updating Fusion on my work machine. Whether these be relating to functionality I am used to changing, or bugs that interfere with my use of the software, there has always been something that goes wrong when I update. Wait. Don’t update as soon as the new release is out. I generally wait about a month now. Generally this should be enough time for the Fusion team to correct initial problems with releases and give them time to submit a follow up patch to fix issues. Keep tabs on the VMware communities forums for Fusion – users will often post issues with new releases here – judging on how much activity appears after a new release, you can generally tell whether its been a bad release or not.